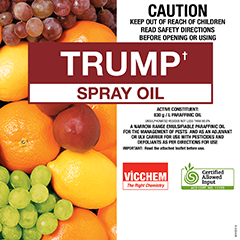 Trump Spray Oil is a blend of highly refined paraffinic oil and nonionic surfactants that is suitable for the management of pests in a range of crops as specified on the product label. The purity of the paraffinic oil (USR not less than 98%) reduces the potential for phytotoxicity compared to many other oil based products while ensuring a highly effective method for managing pests. Trump Spray Oil assists growers in maximizing the value of their produce by killing pests directly and enhancing the performance of certain pesticide products. It can also provide some fungicidal properties. Trump Spray Oil kills pests by direct contact. Typically it coats the insect and causes suffocation however it can also cause death by interacting with the insect’s fatty acids and by interfering with feeding and excretion. Deposits of Trump Spray Oil can also prevent settling of scale crawlers and by repellency, reduce the number of eggs laid. When the spray solution contacts the plant surface, the water separates from the oil and evaporates. This leaves a thin layer of oil over the surface of the plant and insects. Trump can be used on a wide variety of vegetables, fruit, nut, and plantation trees, field crops, shrubs, greenhouse plants and ornamentals as specified of vegetables, fruit, nut and plantation trees, certain field crops, shrubs, greenhouse plants and ornamentals as specified on the label. 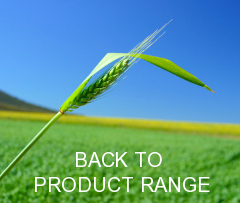 Trump Spray Oil can also be used in combination with certain fungicides, herbicides and insecticides as a wetting agent / adjuvant / carrier as specified on the pesticide’s label to improve performance through enhanced coverage and penetration.